Spring cleaning sessions and little bursts of decluttering feel good, but like lost pounds, clutter comes creeping back. If you want to make your decluttering efforts stick, engage in purposeful decluttering. When you identify why you want to let go of your stuff, it’s more likely that you will protect your decluttered space. When you approach decluttering with the purpose of creating a calmer space, less stressful work-week, or a healthier, happier life, you won’t be easily derailed by the allure of more stuff. Use those whys as leverage to prevent the clutter creep. When you come across a great offer at your favorite store, or see a compelling advertisement, go back to your why. 2. Choose what to keep. Instead of getting rid of a few things because it’s spring, create an intentional practice of letting go. Intentionally give away 50% of your stuff. Create your own intentional practice or challenge. Use mindfulness to make the practice meaningful and give your decluttering efforts staying power. 4. Enjoy the other side of clutter. Instead of working all weekend decluttering, checking it off the list and moving on to the next thing, stop. Take time to celebrate your new space. Breathe and move around in. Revisit your whys and linger in your new space. 5. Institute a purchase pause. To be purposeful about living clutter-free, you’ll have to be purposeful with your purchases. If you’ve purchased things you don’t need or want and later regret the decision, check out these 5 ways to start a purchase pause. With a small time out, you can fully consider your purchases and make informed decisions about what really makes you happy. Create a life and a home that you love, not what you think you should love, and not what other people love. 7. Trade guilt for gratitude. If you struggle with guilt about letting go, holding on, money spent, or time wasted, it’s time to shift every guilty thought to one of gratitude. If you are thinking, “I shouldn’t have spent that money?” trade your thought for “I’m grateful that I recognize what’s most important to me now.” Allow your guilt to trigger gratitude and move one thought at a time from guilt to gratitude, because you have paid enough. If you need to boost your feelings of gratitude, try the 100 days of happiness challenge, keep a daily gratitude journal, or send a thank you note once a day, or once a week to someone who makes a difference in your life. The next time you declutter, identify what you are making room for. Knowing what brings you joy, and matters most will help keep the clutter out for good. Thank you, Courtney! This is the tricky one for me: making my decluttering efforts stick. I appreciate the new round of inspiration and useful ideas to keep simplicity on the roll. I have been de cluttering but haven’t written down my whys. I think it’s time to do that. I’m excited to try the KonMari method for my clothes – finally read the book! This is very well put. Thank you. We’re working on downsizing so we can stay in our same small house as our family grows and the demands on our living space increase. I’m writing about our simplification efforts each week as we’re working through this. I think you’re right, having a purpose allows it to become a lifestyle choice instead of merely a temporary clean up. 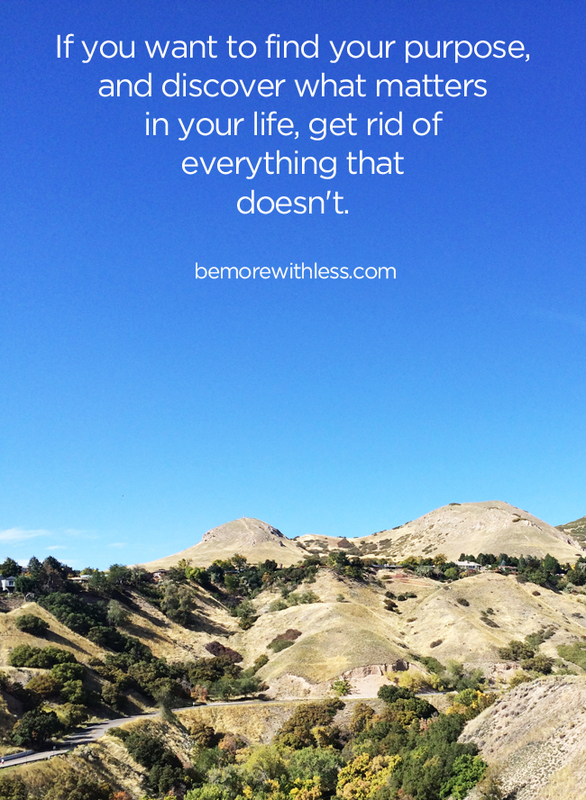 Deciding “what to keep rather” than “what to get rid of” was the big game changer for me. I pick up each item and ask, Do I love this? Do I use this? Do I need to keep this? (the last one is for paperwork and records). 80% of the time the answer is “no”. These are excellent tips! I’m getting ready to a do a huge round of purging as I move to a new house, and I’ve been trying to flip my mindset from “What should I get rid of?” to “What should I keep?” I like the idea of curating a home, and that means selecting my favorite things, not just getting rid of X amount of items. Thanks for this post! I have been purposefully decluttering so I can move into a smaller space. I’ve made a list of the things I really need and have been getting rid of the things I don’t love, need or use. Even though I won’t be moving right away it still makes me happy to walk through my decluttered rooms and see only those things that will go with me when I do. I feel lighter and freer already! For us, the why is to move to a smaller space in the future. We got rid of a whole lot of stuff, but there is just too much of it. It is a very gradual project to let go. It will definitely take a few more month’s to be done. Great post….and great timing. I just de-cluttered my pantry/closet last night. It is interesting what we can learn about ourselves when we do this. For example, there were some items that I quickly and easily got rid of. However, there were some books that were not as easy for me to give away. A part of me resisted, but I reminded myself that I will never read those books again, so I let them go. It can be a cleansing process for sure. 1-7, all good. I especially like your positive approach in #7 to overcoming guilt for sunk cost. I had been going through boxes and bins for a month or so now. On a top shelf of a closet was a telescope. While most things were given a way or thrown away, the telescope was a keeper. I was thrilled and rediscovered my love for astronomy. I will try No 2 when I have to clear out a showcase next time. Pick all I want to keep, transfer and the rest, including the showcase, is easy 🙂 Thanks for the idea! I needed to read this so badly, and at this very moment. I’m about to head downstairs to pack up my Christmas decorations. Yes, it’s May. They’ve been in a pile down there since a few days after Christmas. The “does this bring me joy?” suggestion is perfect for the task at hand. Many of the items are family keepsakes that do bring me joy, but many are just trinkets that have been added to the “Christmas Stuff” over the years. 50% of it leaves my life today. Thank you! This is brilliant. I love asking the “why” question behind excessive purchases– what desires or needs are beneath those? And also, to let go of the guilt and shame of poor past decisions. You’re right, we’ve paid enough already.